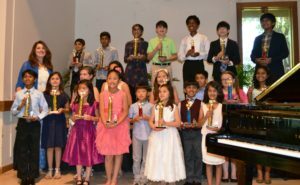 Congrats to all the students on fine performances at the Spring 2016 recital on May 14. Pictured here are students from the 1st recital(top) and 2nd recital (bottom). Thanks to Northminster Presbyterian Church in Roswell for use of the fellowship hall and piano. The students played on a lovely Yamaha grand. Thanks to Corporate Expressions, Inc. for the trophies!